One of the best hostel I have ever been!! The staff is really easygoing and the facilities are excellent! Stayed here for most of the time in Cusco. 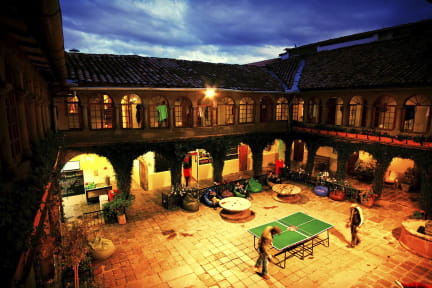 The hostel is really chill —having different activities every night made it very fun. The beds are made everyday and toilets are cleaned often also offers free breakfast everyday! Location is close to Plaza de Armas. All the staff are friendly, VERY helpful, reliable and efficient. I would definitely come back. Everything a hostel should be! Clean, comfortable, fun, friendly staff. Plenty of activities happening around the clock making it easy to meet other travelers. Great hostel. Best I stayed at in Cusco. Hot showers, comfy beds, great location and atmosphere. Loved it. Would stay again. Absolutely LOVED this hostel!!! The staff was so warm & welcoming & they helped us in every way possible!!! Awesome recommendations, location is perfect for all the main attractions, tour desk, breakfast was good & sufficient (more than other hostels offer). It is a bit of a party hostel but things do settle down around 10ish & although there were always events going on I had no problem with noise when I slept. I would definitely stay here again if I were back in Cusco!! Clean hostel, decent breakfast, very social. Sometimes a bit loud when having early starts but music gets turned off at 10pm aud they provide ear plugs. Staff is friendly and they were able to store my bags when I was trekking. A good place to stay if you don’t mind extremely loud music right outside your bedroom door all damn day! Seriously guys, turn it down a notch. everyone in the courtyard is trying to have a conversation, and the people in bed who have a really early tour the next day don’t get any benefit from the earplugs if the music is that loud. Fantastic staff, good and comfy beds with clean duvets. Great location. Good atmosphere. The few drawbacks are: Beds are unbelievably cramped together and there is absolutely no space to put your backpacks so people have to kinda jump over them in aisle and of course floor can't get cleaned. Bathrooms have no (working) ventilation and are so far away. Lockers are numbered without logic, so you have to jump over backpacks to other side of the room instead of using locker next to your bed.